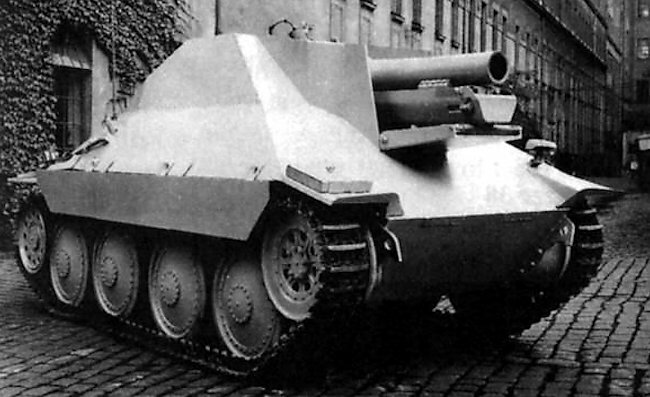 The German Army run factories in Czechoslovakia could produce Jagdpanzer 38(t) Hetzer chassis faster than they could produce the main 75 mm (2.95 in) gun. There were stocks of old 15 cm (5.9 in) s.I.G 33/2 heavy field howitzer guns available to be mounted in those chassis. Troops on the Eastern Front always needed more heavy artillery support. Fixing a 15 cm gun onto an already built Jagdpanzer 38(t) chassis seemed a very sensible idea. 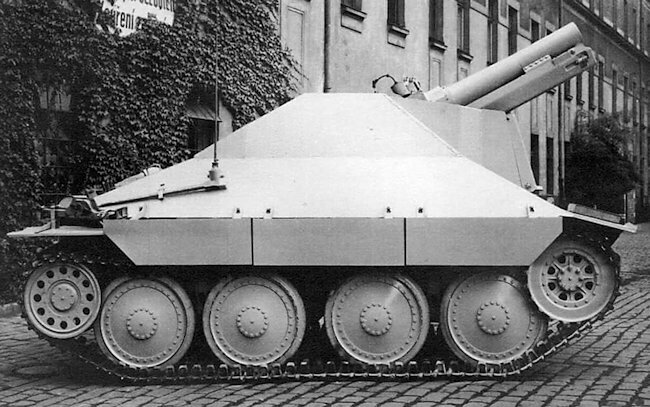 For this prototype, a Bergepanzerwagen 38(t) was used. 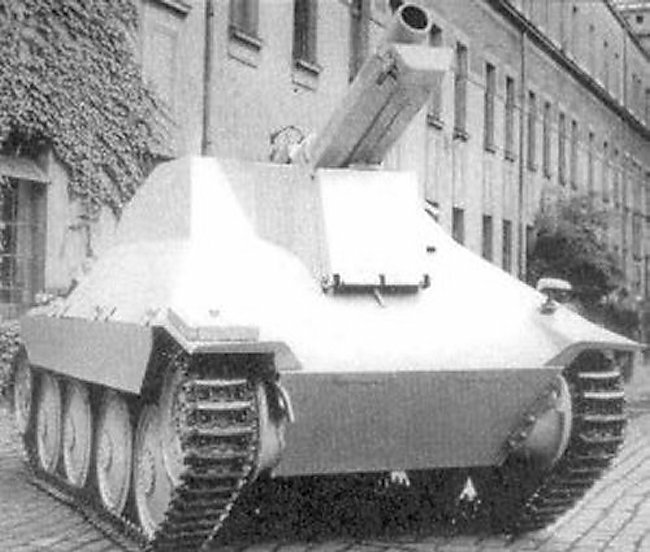 15cm sIG 33/2 (Sfl) auf Jagdpanzer 38(t) prototype. This self-propelled artillery gun was officially designated the 15 cm s.I.G 33/2 (Sf) auf Jagdpanzer 38(t). 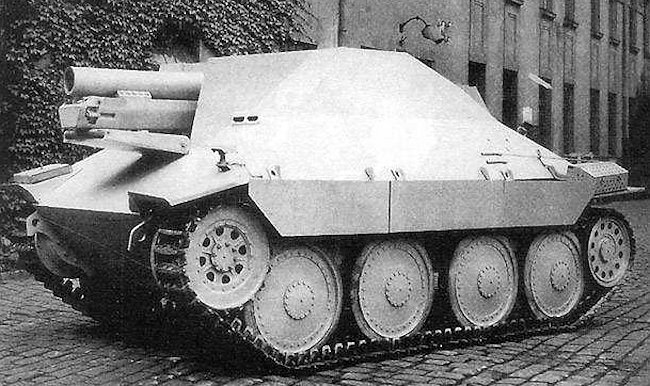 The long version of the name is 15 cm Schweres Infanteriegeschütz 33/2 Selbstfahrlafette auf Jagdpanzer 38(t). Although the word ‘Jagdpanzer’ is used in the name, this vehicle was not a tank hunter. The term ‘Jagdpanzer’ is a reference to the donor vehicle chassis used to mount the 15 cm heavy infantry field howitzer. This vehicle is a self-propelled mobile artillery gun. It is often incorrectly called the Sturmpanzer (38)t. A ‘Sturmpanzer’ is a heavily armored assault tank. It’s crew are protected in a fully armored box, that is enclosed on all four sides and has an armored roof. The front armour of this vehicle is thick to enable it to get close to enemy strong points before firing its weapon. This description bears no resemblance to the function and appearance of this vehicle. It was not designed to advance towards heavily fortified gun emplacements and blow them up whilst under heavy fire. It is only thinly armored and the crew had very little protection. This vehicle was designed to keep up with the advancing infantry and tanks, but remain behind them, out of harm’s way, and fire shells over their heads at enemy targets. This gun was not designed as an anti-tank gun. It was normally used to fire high explosive HE shells over the heads of advancing German troops at targets plotted on a map. This is called indirect fire. Occasionally, it was called upon to fire at enemy positions it could see. This is called direct fire. The two part I Gr 33 HE shell was filled with 8.3 kg (18 lbs) of pressed TNT with smoke box and standard Zdlg. 36 exploder system. The total weight of the fused round was 38 kg (84 lbs). Unlike anti-tank gun shells that came in one piece, artillery shells were loaded into the gun breach in two separate pieces. The high explosive HE shell was always loaded first and this was followed by the propellant cartridge. The rimmed brass propellant cartridge case, with a c 12 n/A percussion primer, was closed at the top by a cardboard closing cap. The gun crew had a range chart that told them what amount of explosive propellant to put into the empty brass cartridge case. The propellant consisted of six removable silk bags numbered 1 to 6 that contained Nitroglyzerin Blättchen Pulver (nitroglycerin flaked powder) or Diglykolnitrat Blättchen Pulver (diglycolnitrate flaked powder). For long distant targets bag number 6 would be put in the brass propellant cartridge case. For shorter distances lower number bags, with less propellant inside, would be used. The gun had an effective firing range of 4.7 km – 4,700 m (2.89 miles – 5,140 yd). When firing HE shells, it had a muzzle velocity of 240 m/s (790 ft/s). A good gun crew could fire three rounds a minute. The shell fuse s.Igr.Z. 23 was a highly sensitive, nose-percussion fuse with an optional delay of .4 second. It operated on impact or graze. It fired two types of HE shell, the 15cm I.Gv.33 and the 15cm I.Gv.38. For all practical purposes they were identical. 15 cm s.I.G 33/2 (Sf) auf Jagdpanzer 38(t) with the gun trough resting on the front armored hatch. The same hatch design was later used on the Grille. 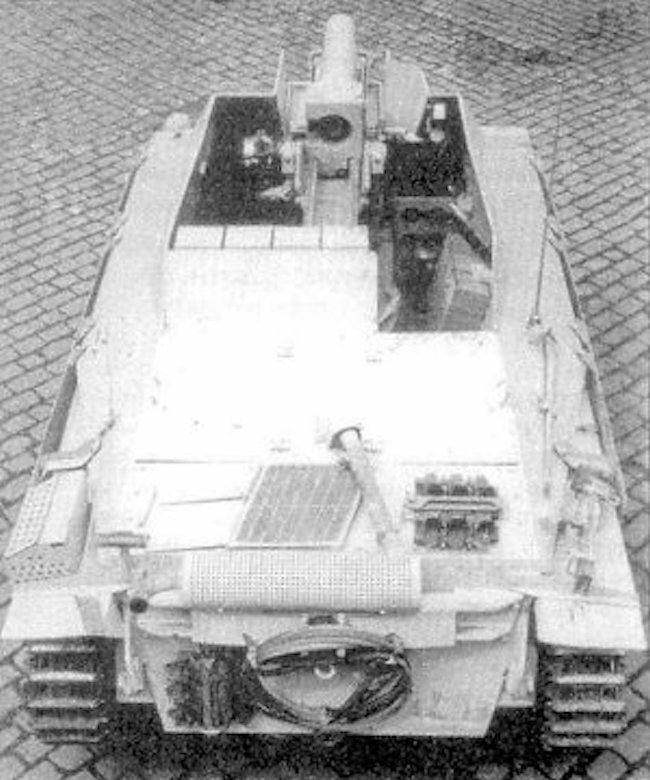 Most history books, museums and websites state that 30 of these Jagdpanzer 38(t) variant SPGs were built. 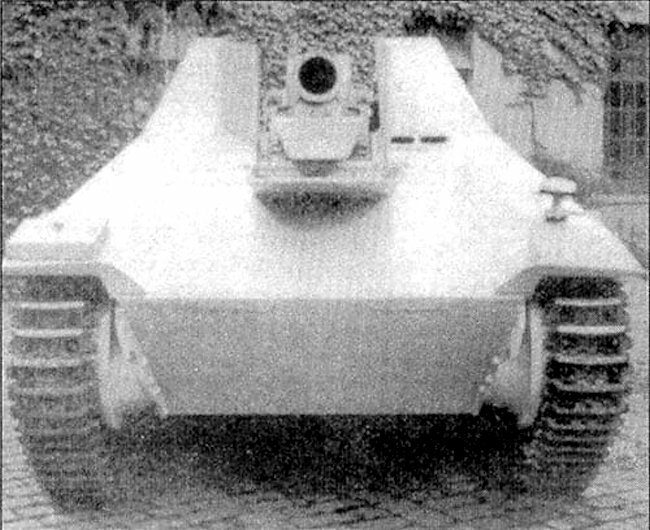 The only known photographs of the 15 cm s.I.G 33/2 (Sf) auf Jagdpanzer 38(t) are of the prototype at the factory. Why are there no operational or trials photographs of this vehicle? The official order exists requesting six to be built by converting existing Jagdpanzer 38(t) chassis and a further twenty four to be built on new chassis by December 1944. No documentation has yet been found to confirm that the order had been completed or delivered. It is assumed that they were issued to schwere infanterie-geschutz (heavy infantry gun) companies of armored infantry regiments on the Eastern Front, but the exact ones have so far not been identified. No regimental records have been found showing receipt and deployment of these weapons. There are no Soviet photographs of captured or knocked out wrecks of this type of vehicle. None have so far been identified in photographs of Allied German military vehicle scrap yards in Western Europe. At present it cannot be confirmed that thirty 15 cm s.I.G 33/2 (Sf) auf Jagdpanzer 38(t) Hetzer were built even though an official order was issued authorising their manufacture. It can only be confirmed that a prototype was constructed. 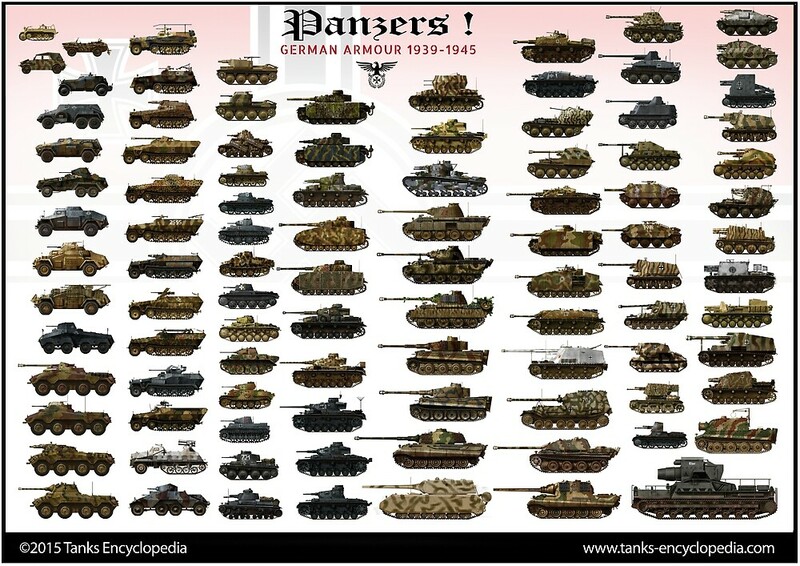 Spielberger’s book ‘Panzer-35t/38t’ on page 171 -172 states that an additional 30 were built between December 1944 and February 1945 and used as a support vehicle for the Panzergrenadiers. Six converted from existing Jagdpanzer 38(t) chassis and 24 newly built. Note:- Unfinished Jagdpanzer 38(t) Hetzers would come from a holding area off the production line. It was not uncommon for production completion to be held up waiting for the main gun to be finished in a different or separate part of the factory. The Specifications table lists the wrong gun (The Jagdpanzer 38T’s original gun), but not the 15cm sIG 33 gun. Upon closer inspection, it’s just a copy + paste of the Jagdpanzer 38T’s table, as the total production states 2,827 built.